Truly. 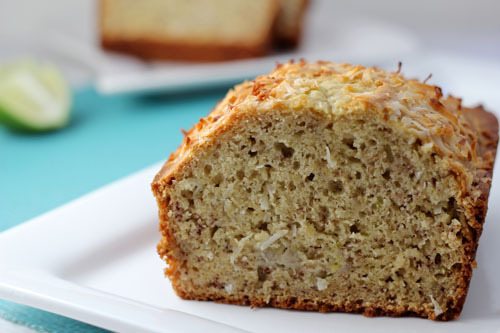 All you need is a sliver of this Lime and Coconut Banana Bread. It is spiked with rum. Yeah, I said it but just to drive it home…spiked with RUM! Eating a slice won’t get you tipsy, but it will make you happy and might even make you hum a tune or two…like this. And making it is just as easy as any quick bread in the world but it is spiked with RUM! Are you beginning to worry about me? Well, good. It’s about time. I have been blogging for almost three years now and if you weren’t worried about my sanity now and then, you either weren’t paying attention, or I think it would be safe to assume your sanity has vanished some time ago. Kindered spirits we are then. Now I’m talking like Yoda. See? Sanity has officially left the building. It’s highly over rated anyhow. By the way, this bread is perfection. It has a tang from the lime, a sweet wink from the banana but not an all out sugar rush, and a little crunch and tropical fun from the coconut. And finally, it has that nice three tablespoon hit of rum that makes you say, mmmhhhmmm. optional: stir in chopped macadamia nuts or walnuts with the coconut. Yum! To make the bread: Preheat your oven to 350 degrees Fahrenheit. Spray a loaf pan with nonstick cooking spray. In a large bowl, whisk together flour through sugar. In a medium bowl or extra large liquid measuring cup, cream together butter and eggs with a rubber spatula. Add mashed bananas through coconut extract and combine. Add the liquid ingredients (50% at a time) to the dry ingredients and stir together. Add the coconut and stir. Fill the loaf pan with the batter and bake for 45-55 minutes or until it is golden brown on top and tests clean with a toothpick placed in the center of the loaf. Oh, YUM! I’m SO taking this to the beach with me when I go. It’s the perfect little something different for a springy breakfast. This looks delicious! I have been saving some bananas to bake some oatmeal cups, scrapping that idea! Put the lime in the coconut…! I saw the lime and coconut and wondered how they’d get along with the bananas, Geni. I couldn’t quite wrap my palate around the combo. And then I came upon the dark rum. Ah, rum. The great equalizer. Of course the lime, coconut, and bananas would go well together if there’s a bit of rum to smooth out their differences. This must have been one tasty bread, I’ll bet. Um, this sounds like exactly what I need. For real. I think I like the original version of the song better but the bread looks fantastic! Can only imagine this bread freshly baked, the aroma must be fantastic. The toasted coconut on top would be all the coaxing I would need to try a slice with my cup of coffee in the morning. 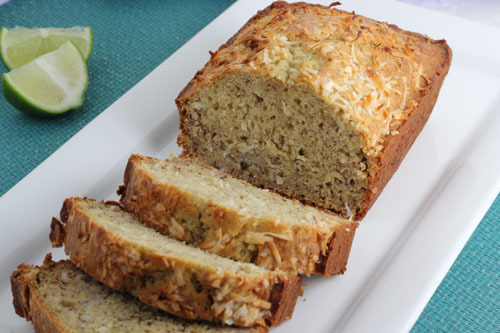 I love the twist of this banana bread with coconut and lime. Great with tea or coffee, for breakfast or afternoon snack! Your sweet bread sounds delicious…I’m going to be singing that song all day. Time to relive the old ways with your gorgeous looking bread! I LOVE spiking banana bread with alcohol! I’ve done rum and amaretto before…it’s the best!! And the lime coconut combo is one of my favorites. Heavenly. Anything spiked with rum it for me! 🙂 Sounds great Geni and love the muppet video. This bread looks fantastic, Geni! 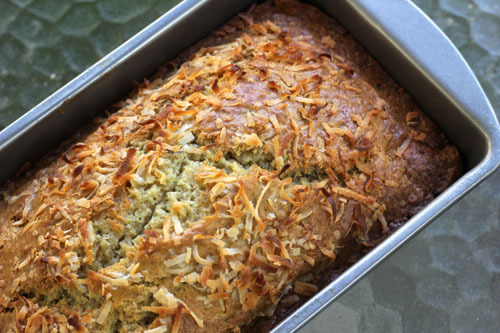 Coconut and lime banana bread? I LOVE that. I am always searching for new ways to use up my “ripe” bananas. Coconut and lime is a fantastic combination of flavors! I very much enjoyed the post with the adorable video Geni!